A new generation of masonry bridges was an important part of the overall vision held by the city’s planners at the turn of the century. Starting with Joseph Earnshaw and John C. Olmsted, who were instrumental early in the development of the city’s park system, the idea of an improved Fall Creek Parkway with stately bridges took hold. Park Superintendent J. Clyde Power and the Marion County Commissioners oversaw the construction of the three oldest existing concrete arch bridges across Fall Creek along the parkway. The Central Avenue Bridge was constructed first in 1899, designed by engineers Gansburg, Rowey & Haywood. This triple-arched bridge is faced with massive rock-faced limestone blocks and features semi-circular refuge bay lookouts at the intermediate piers. The Melan Arch Construction Company of New York laid out the Illinois Street Bridge in 1901. Its three broad concrete arches are faced with limestone and stone basketweave-laid blocks form the balustrade. College Avenue Bridge followed in 1905; H.C. Adams was the stone mason. The College Avenue Bridge suffered damage in the 1913 flood. The city soon repaired and rebuilt it, much as it was. Both College Avenue and Illinois Street carried interurban and trolley lines into the new northern suburbs. 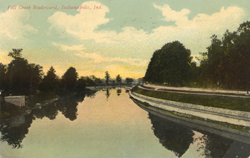 During his years as a consultant to the Indianapolis Board of Park Commissioners, George Edward Kessler continued earlier schemes to replace iron bridges with masonry spans. He designed two major bridges to complete the Fall Creek corridor. Kessler and associated engineers on the projects used the Melan arch, but Kessler’s distinctive “City Beautiful” classicism cloaks the concrete structures in Indiana limestone. The Capitol Avenue Bridge is more restrained, with paneled spandrels and piers and a simple oval cutout stone railing. In 1901, the city funded construction of a concrete arch bridge on this site, but the 1913 flood heavily damaged the bridge. The park board and city chose to build a new bridge in 1915. 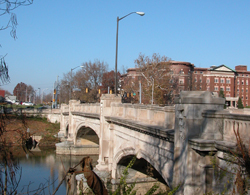 Kessler planned an especially decorative treatment for the Meridian Street Bridge, fitting with the street’s status as Indy’s main north-south residential artery. Channeled ashlar stone, cartouches, and swags ornament the piers. The railing is a Classical balustrade. Recently, the city installed replica 1920s light standards on the bridge as part of its ongoing maintenance and restoration. In the 1980s, the City County Council rededicated the bridge as a memorial to community leader Joseph W. Summers. All of these bridges used a variant of the Melan arch system. Viennese engineer Joseph Melan patented his design for combining iron or steel ribs with concrete, creating one of the early techniques of making reinforced concrete. The arch-shaped I-beam ribs had the great tensile strength inherent in wrought metals, while the dead weight of concrete encased and protected the iron members. Because of the steel ribs, the concrete could be comparatively thin at the center of each span. The stone veneering was decorative, intended to lend monumental character. The bridges are along Fall Creek Parkway, part of the Indy greenway system open to the public from dawn to dusk, and can be visited on a short driving tour. Avoid early evening and morning commute times. From downtown Monument Circle, College Ave. is one way to the bridges and Capitol Ave. is one way back to town, making a good circuit for auto, bicycle, or bus. INDYGO bus line from downtown: #17 College, disembark near 25th St.